The Interreg-project “Bones4Cultures” has just been started. Its aim is to analyze population, life, health and culture of the people that lived in the German-Danish border land during the Middle Ages (AD 1050 – 1536). 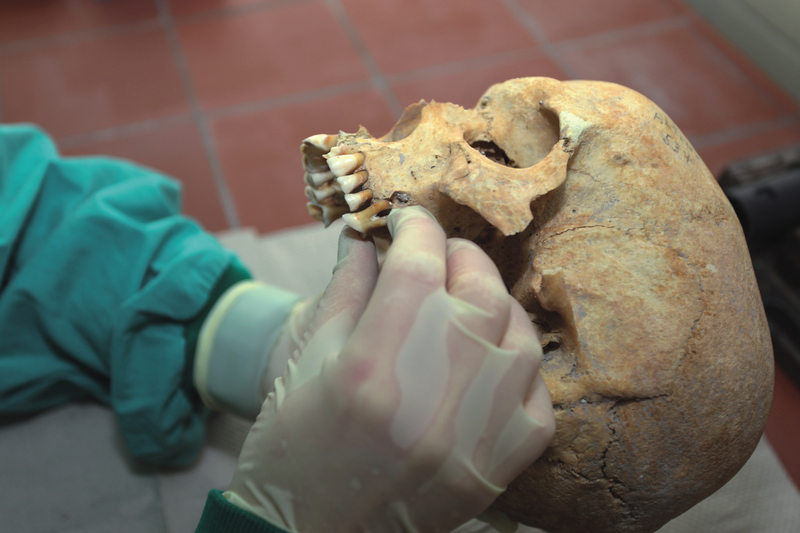 Researchers from Denmark and Germany will examine skeletons of people, who used to live in the city of Schleswig and in other parts of Germany and Denmark during this period. Approximately 1000 human skeletons will be analysed during the three year project period. Samples will be taken from 350 skeletons for a more detailed chemical and physi-cal analysis. The project is funded through an allowance of 530.000 Euros form INTERREG4A and is co-financed with a total of 280.000 Euros from Kiel University, University of Southern Denmark (SDU) and Schloss Gottdorf. From the 6th century onwards ethical and political conflicts were common in the region along the Ger-man-Danish boundary. In the medieval context the conflict was accentuated when Schleswig was made a duchy – demanding increasing independence from the supremacy of the Danish king. From this period onwards the region was increasingly Germanized. Schleswig and surroundings remained an area of conflict between Germans and Danes to after the 1st World War when a referendum in 1920 made the northern half of the duchy Schleswig Danish and the remainder German. From this point onwards the region has been peaceful and it has acted as an example of good ethnic relations in a mixed region. On this background it has become a pertinent question: where did the ancestors of the present-day Schleswigers come from? Were they born and raised in Schleswig or did they come from other parts of Germany, Denmark or even from aboard? Up to now, we only have a vague knowl-edge of the history and identity of the common people from the Early Middle Ages to the Renais-sance. The project “Bones4Cultures” aims to close this gap in the understanding of our joint his-tory. In the process, new analytic techniques will be developed and it is expected that the regional medieval population around the German-Danish boundary will be among the best known ancient populations in the world. Researchers from SDU are in the lead position; the German partners comprise researchers from Kiel University, GEOMAR | Helmholtz Centre for Ocean Research Kiel and the Center for Baltic and Scandinavian Archaeology (ZBSA) at Landesmuseum Schloss Gottdorf. The selected bone samples will undergo new chemical analyses for detecting strontium, lead and mer-cury. “Even small amounts of the latter are toxic. Nevertheless, mercury was used to heal certain dis-eases, lead was part of ceramic glaze of everyday house ware”, explains Professor Kaare Lund Ras-mussen of SDU. The detection of these elements will make it easier for the scientists to study common diseases in the Middle Ages, their treatment and the heavy metal contamination at that time. Performing a strontium/calcium-analysis, which may be conducted on samples taken from dental mat-ter, can answer questions concerning common diet. “We wish to know who lived on a predominantly vegetarian diet and who ate meat. The strontium isotopes will also give us information on mobility and sedentarism, because they differ due to regional occurrences”, says Professor Anton Eisenhauer with GEOMAR. Caption: The cross-national research project Bones4Culture discloses the secrets of the history of the German-Danish population.